Zoosk, the dating site that “learns as you click”, will match you with “more singles that are more your taste”, whether you’re looking for a fling or a serious relationship. What stands out about the platform, is how friendly and easy to use it is. With intuitive features, a clean display, and various interactive communication options, you are sure to enjoy your online dating experience on Zoosk. Read to learn more about the site and why 35 million singles worldwide are loving it. Profile Carousel: This fun, Tinder-style quick match feature lets you rotate through potential matches swiftly. Based on each user’s profile picture, name, age, decide whether you’re interested in connecting with them, and mark “yes”, “no”, or “maybe”. Those who you are interested in meeting will receive a signal about it. This feature is perfect for users who are good at making snap decisions. Free Search: Zoosk gives you thousands of keywords and parameters to use in its wide-ranging search section—perfect if you just can't wait to find your ideal match. Narrow down users on the basis of their lifestyle, age, religion, social habits and location. If you're looking, for instance, for a Christian match, or a match your age, you will be able to filter your search results accordingly. Behavioural Matchmaking: Zoosk’s trademarked behavioural matchmaking technology picks up on your taste as you use the app. Every day, Zoosk members receive a potential match, also known as the SmartPick, chosen by the algorithm based on their own preferences, trends and search tendencies. If you’d like to connect with your SmartPick, all you have to do is click "Like" and hope that they do the same. Becoming a Zoosk member takes minutes, and involves a simple email verification process and answering a few questions about your age, location and appearance. Since you will be asked to specify your gender and the gender you're looking for, Zoosk is suitable for straight, gay and lesbian singles. In addition, users can filter matches by age, making the site a good choice for singles over the age of 50 as well. Once you’ve signed up, you can spend more time filling out your profile, your story, and explaining what you’re looking for in a match. Ensuring the highest level of security is a major priority for Zoosk. That's why every new sign-up is scrutinised by a site representative who performs identity checks and carefully reads the member's profile text to ensure that they are who they say they are. Users can add a further layer of protection by activating the private browsing option. Zoosk also offers a dedicated safety tips page which offers advice on many areas of concern for online daters. These include, creating a safe profile, chatting online, meeting offline, and identity fraud and scamming. This resource can be found on the left hand side of every page. There's a fair few things on the site that can be done for free, including the initial signup and browsing of profiles. However, if you are matched with a dater and are interested in communicating, it will then be suggested to you that you pay for a subscription. Upon becoming a paid member, you will be able to see the members that have been checking out your profile, and send messages and chats to other users via Zoosk messenger and inbox. A 1-month membership is £22.74, which can seem quite expensive. To get the most competitive price, it is worth signing up for longer. 3 months drops to £15.98/month, and 6 months is a reasonable £11.99, saving you 60% on a full price month. 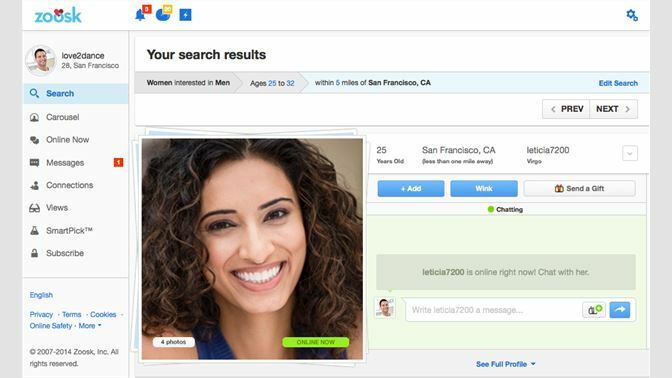 Zoosk has an extensive help center including a searchable FAQ section. You can speak with a customer service representative directly via one of the Zoosk social media outlets including Facebook, Twitter, G+, or Instagram. Zoosk has remained one of the premier dating sites by investing plenty of time and attention into its matchmaking features and the most sophisticated technology. This has all given the site a reputation for good value, an enjoyable and stimulating user experience and—most importantly of all—a strong likelihood of a member discovering the right match.